UPDATE 12/2/17 – Donthe Lucas has been charged with first-degree murder in Schelling’s disappearance, which officials are now calling a homicide. Lucas was already in custody in Pueblo on separate charges after he was arrested last month at Denver International Airport in a robbery and assault case. 4/14/17 – The authorities are digging in the backyard of a home of a person of interest in the disappearance of Kelsie Schelling. Sgt. Eric Gonzales with the Pueblo Police Department said they received a tip. After they obtained a search warrant they began digging in the back yard of Manor Ridge Drive in the Regency neighborhood, where Donthe Lucas, a boyfriend of Kelsie’s, lived. Investigators said they found evidence in the yard of the home in the 5100 block of Manor Ridge Drive. They wouldn’t say what the evidence is, but said it was not a body. NOTE: In 2015, KRDO NewsChannel 13 reported that Lucas was named a person of interest in a federal court document, but Deputy Police Chief Andrew McLachlan said that Lucas was not a person of interest. 5/19/16 – Police are wanting to talk to a man that is seen on a video taking Kelsie Schellings missing person poster’s down. “For the simple fact of the high profile of this case. Any other yard sign doesn’t really draw concern, but when it’s a high profile case we take it seriously,” Sgt. Eric Gonzales, Pueblo Police Department spokesman told KRDO-TV. As I look at the video it seems to me as though the individual may have some black writing on the back of his shirt. In fact, he is dressed almost like in working clothing. The type a Sparklett’s delivery driver would wear or maybe even a swimming pool employee. Especially a swimming pool employee as he is wearing shorts. A MPofA Facebook fan said it might say “Security” on the back of the shirt, and maybe it is a security officer. Police say the signs were taken on May 4 by a man who was driving a blue minivan. If you recognize the man in the surveillance video, or know more about the incident, call Detective Shane Pope at 719-553-2441. UPDATE: 5/31/15 – On Saturday family and volunteers were searching for Kelsie again, but found no sign of her. me. I hoped it was a sign that something would come to light today,” Kelsie’s mom Laura Saxton told 11 News. UPDATE: In a bold move by Kelsie Schelling’s family they have filed a lawsuit against the Pueblo Police Dept. The family is accusing the Pueblo Police Dept. of covering up a crime. UPDATE: The lawsuit was dismissed by a Judge in Feb. 2016. Upon reading the story by CBS Denver I found out that Laura Saxton, Kelsie’s mother has filed a lawsuit against the Pueblo PD, stating they lied and destroyed evidence that their pregnant daughter was murdered by her boyfriend. The paperwork states, “intentionally lied and falsified information about evidence.” They also claim the Kelsie was “feloniously killed” by Donthe Lucas who was the father of Kelsie’s unborn child. 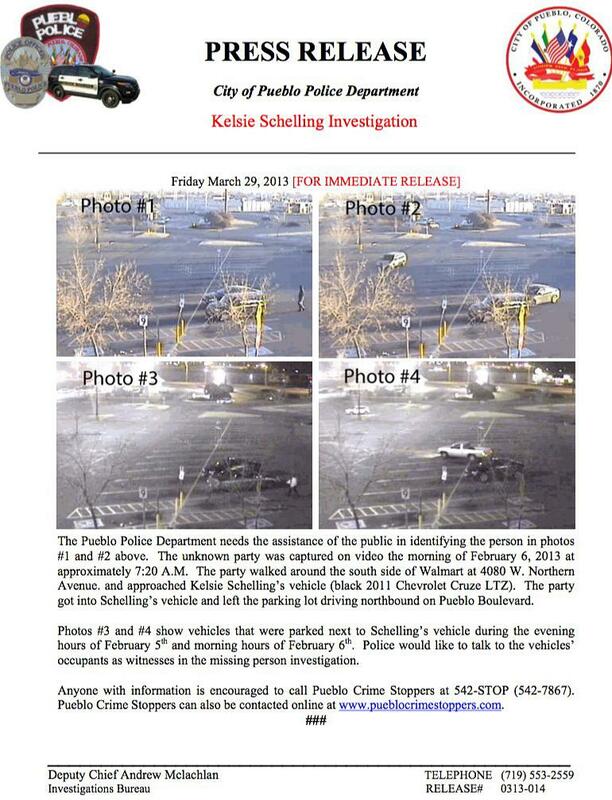 The document states that the family filed a missing person’s report, but as of Feb. 5, 2015, there is no record listed within the Pueblo Police Departments online records database that Kelsie disappearance has ever been logged as an open investigation… there has never been a Pueblo PD case file number identified to Kelsie’s family or the the private investigator. The lawsuit also stated that the Pueblo police failed to retrieve evidence from the Denver Police Dept. to summit to the lab to obtain DNA classification required to be submitted into a national database. As you can read below Kelsie was last seen at Walmart where she was going to meet Lucas. Video surveillance shows Lucas parking Kelsie’s car and taking out $400 from an ATM with Kelsie’s bank card, but Kelsie is not seen in the video. “Why is that not enough to be more aggressive about this?” said Laura. Private Investigators stated in the court documents that a detective with the Pueblo police admitted to them that he had lied and the police had found fingerprints and dried bodily fluids in the trunk of the car. Then the clincher is the family says the detective assigned to the case confessed that he lied to them about the evidence and that evidence was never submitted to the crime lab. AND a fisherman at a lake said he snagged some human remains while fishing, but the police never searched the lake. Two private investigators under the eye of the Pueblo Police searched Kelsie’s car and found fingerprints on the driver’s side visor mirror and damage on the undercarriage of the passenger side of the car and gathered a human hair from that area. They also found hard-yellowish substance that were on the front of the car in several areas. The PI’s asked the Det. leading the case to process what they found, but he refused to do so, and the Pueblo PD would not take possession of the evidence. The police stated that the evidence they obtained should be processed by a private lab at the expense of the family. The PI’s also saw that the navigational system recorded the last destination of the vehicle. The Pueblo Police have yet to gather this information although they stated they would do that. Also, what has never been mentioned before on this case, is after Donthe was seen parking Kelsie’s car on Feb. 5, his mother is seen picking him up at the rear of the store. The car stays at that parking lot until an unknown person comes out from the rear of the store on Feb. 6, and gets in the car and and drives it away. It was found by the family submitted the video to be professionally enhanced and found at that time that the person who approached the car had used the vehicles key which are computer coded. Kelsie’s car was found at a hospital parking lot. The family asked the Pueblo police to submit the video to the FBI for analysis and they refused. The person fishing actually followed his snagged line and found it was snagged on the upper head and torso of a human. He saw hair, but dropped it after he became started at his discovery. According to the lawsuit, although a Det. was taken to the exact location of where the body was found, the Pueblo police never went back to search and no request was make for a dive team to search. We have not heard the Pueblo Police Departments side of the story and they have not had a chance to answer to this complaint. Regardless, we can’t help but wonder, why the police did not discovered the evidence that the private investigators found. We can’t help but wonder why no one as gone to the lake to find if there really is a body there. Kelsie’s family deserves answers and I applaud them for courageously going forward with this lawsuit to find those answers. It looks as though it was the only way they were going to get to the bottom of what happened to their daughter and to receive justice. UPDATE 4/29/13 – Kelsie’s parents have stated that Kelsie was in Pueblo for a doctors appointment because she was allegedly 8 weeks pregnant with her boyfriend, Donthe Lucas’s child. 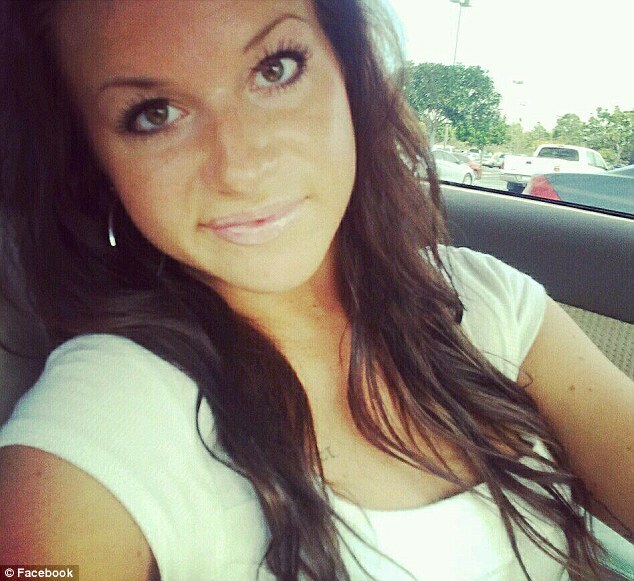 Kelsie Schelling disappeared last month. She was last seen the night of Feb. 4 in Pueblo after traveling there from Denver to meet her boyfriend Donthe Lucas. Schelling’s mother Laura Saxton said earlier that day her daughter was in Denver for a doctor’s appointment, where she learned she was eight weeks pregnant with Lucas’ child. The family says Schelling went to Pueblo that night at the request of Lucas. The family also stated that Kelsie’s bank account has been accessed and messages have been sent from her cellphone. Schelling’s black Chevy Cruz was also caught on surveillance video in a Pueblo hospital parking lot three days after she disappeared. Her car was found abandoned at St. Mary Corwin Hospital in Pueblo Thurs., Feb. 14, 2013. Read more here. 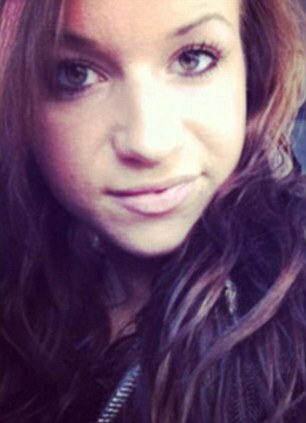 Kelsie Jean Schelling, 22, from Larimer Square in Denver, Colorado was last seen in Pueblo on Feb. 4. Denver police spokesman Sonny Jackson called Schelling’s disappearance ‘out of character,’ but added that police do not suspect foul play at this point. According to investigators, Schelling’s car also has gone missing, and they believe that locating the vehicle would bring them closer to finding the student, Fox 31 reported. Officials are now searching for the black 2011 Chevy Cruze LTZ with the license plate 023-WRL. Schelling,is described as being 5’4″, 120 pounds with dark brown hair and hazel eyes. Police say the woman has a trio of tattoos on her body, including a fleur-de-lis on her rib cage, a Chinese symbol on her neck and a cursive scrawl on her left arm. Schelling’s parents launched a Facebook page called Help Find Kelsie to spread the word about their missing daughter.